The studio we’re in is billed as “the Radio 104.5 Performance Theater” — that last word being a generous description. It’s a single room filed away inside of a charmless, concrete-gray three-story building, just big enough to house the stage, several rows of chairs, and a soundboard. Trophies from past guest appearances (gear autographed by Fall Out Boy and New Found Glory, a framed photo of Courtney Love singing) decorate the walls. Alex is here, on this October afternoon, to strum two songs — one original tune, one cover — as part of the station’s “Live at 5” series, which broadcasts brief live performances from local acts, every Friday at 5 p.m., right as listeners are leaving their jobs and settling into their cars for the commute home. Typically, when Alex takes the stage he’s accompanied by the other members of Beach Slang, the punk foursome that he fronts. His face is usually streaked with sweat, his voice quaking with emphasis, his guitar careening wildly. Normally, there’s a good chance that he’ll either faceplant or fall backwards, as if floored from simply feeling too much. But this isn’t a standard Beach Slang show; it’s an intimate, subdued affair — aside from myself, the audience consists of the group’s drummer, JP Flexner; second guitarist, Ruben Gallego; and manager, Eric Osman. Also present is Wendy Rollins, the radio DJ who will interview Alex and (rightfully) compare his work to that of one of his musical heroes, Paul Westerberg, leader of drunk-punk demigods the Replacements. All of this is to promote the recently released The Things We Do to Find People Who Feel Like Us, Beach Slang’s thrilling debut album, which is not only one of the most buzzed-about rock albums of the last few years, but even more impressively, the result of one man’s refusal to give up on his rock’n’roll dream. Now he’s living it. 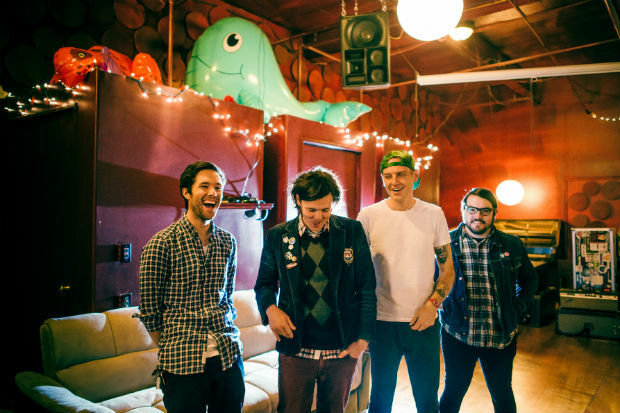 Whether or not Beach Slang deserve the tag of “embarrassing” depends on how you feel about songs that run on loud guitars and louder emotions. Armed with refreshingly un-self-conscious anthems, the band occupies a realm that fewer and fewer musicians appear to be exploring: Theirs is a teenage wasteland, where the stakes always feel higher than they actually are, where sincerity is prized above all else, where beer never gives way to bloating, and sunrise only promises new opportunities, never a hangover. If that sounds like the same sort of salvation that Alex found in his favorite records, then bask in the light. If that sounds like the death throes of a genre on the verge of extinction, you’d best move along. Curious as it may seem for a man in his early forties (who’s also a husband and relatively recent father) to be rebelling against an imagined authority figure clucking its tongue, Alex wears the role — along with his schoolboy-punk uniform of an argyle sweater vest, short-sleeved collared shirt, and corduroy pants — very well. His protests are just too positive to come off as petulant. (“Jeez,” he says after imparting a few life lessons, “I’m a walking inspirational poster.”) It also doesn’t hurt that he could easily pass for a man 12 years his junior: The faintest lines may be starting to set in, but his cheeks are still flushed with youth, his arms decorated with colorful sleeve art, his auburn cowlicks consistently poking out from underneath his trucker hat. So far, his excitement has been met in kind by fans. According to Alex, The Things We Do to Find People Who Feel Like Us ranks as the most pre-ordered album in the history of Illinois-based label Polyvinyl, whose roster includes comparative indie-rock vets like of Montreal and Japandroids. He says fans are already tattooing song lyrics onto themselves. (The most commonly inked line, he believes, is “I hope when I die I feel this alive,” from last year’s “American Girls and French Kisses.”) Simply put, no other rock band issuing their debut this year has this kind of excitement surrounding and supporting them. The NPR footage exposes — more so than the recordings on The Things We Do or the two preceding EPs, 2014’s Who Would Ever Want Anything So Broken? and Cheap Thrills on a Dead End Street — just how delicate Alex’s songs truly are. Interpreted with a lone acoustic guitar, rather than a wall of electrics, Beach Slang’s rallying cries become tender valentines, precious odes to adolescence sung by someone on the other side. One of two sons to a couple that divorced when he was a toddler, James Alex was born James Alex Snyder and raised by a single mother. “She’s a hell of a mom,” he says. “What she is to moms, my dad’s the exact opposite to dads.” Growing up, Alex bounced around a cluster of small cities and suburbs located about 60 miles north of Philadelphia, while his mom held down a handful of jobs — among them, sterilizing instruments in a hospital and working laundry at a nursing home. They’d spend summers in Newport, Rhode Island, where his mother hails from originally; his father, a gunner for the Navy, wasn’t really in the picture. His band broken up, Alex participated in a few musical projects that didn’t lead much of anywhere, and then chose to focus on visual art, graduating from the Art Institute of Philadelphia at age 34. But even while he worked in graphic design, Alex continued to tinker with songwriting, drawing from early Goo Goo Dolls records and the Replacements’ latter-day output, with bits of inspiration found via two titans of hard-lived romanticism: Charles Bukowski and Hunter S. Thompson. Encouraged by Flexner to share his new material with the world, Alex met with Flexner and bassist Ed McNulty in the second half of 2013 for an impromptu jam that quickly turned into something much more permanent. Soon enough, the second EP followed; then a slot opening for heady emo heavies Cursive on their 2015 reunion tour; then the fan tattoos; then the deal with Polyvinyl; then their first full-length; then a headlining tour booked across the U.S. and into Europe. When he’s live on the WRFF airwaves, Alex softens the lead single from The Things We Do, a chip-on-its-shoulder beauty labeled “Bad Art & Weirdo Ideas.” With his eyes closed and feet dangling in front of the stool, he sings, “I’m always that kid, always out of place / I try to get found / I’ve never known how.” For the cover song, he moves into Death Cab for Cutie’s teary 2005 pledge “I Will Follow You Into the Dark.” Alex had to choose from a list of station-approved tracks, but considering the subject matter — childhood memories stained by a stern grown-up, the promise of a love that transcends this life and carries onto the next, the strange allure of moving on into the unknown — it’s not surprising that he landed on this one. 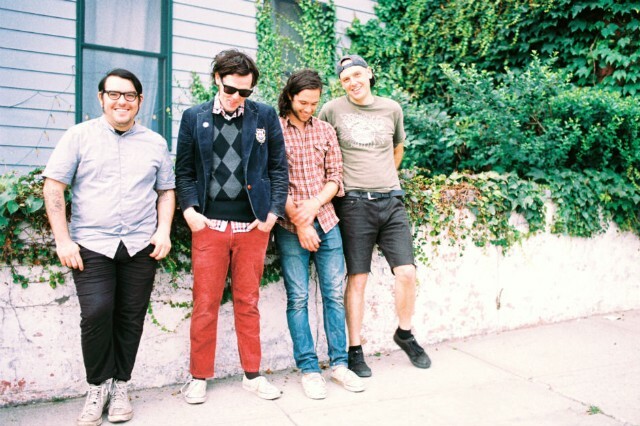 Beach Slang’s songs are rowdier, but no less heartfelt. After the radio broadcast ends, we head back down to the building’s lobby, and are greeted by an evening storm. The afternoon’s clear skies have been corrupted by dark gray clouds, the trees beaten with wind, the office windows peppered with raindrops. Alex and I run through the rain, heads hunched, over to his car, which we’ll use to follow Gallego and Osman to a nearby restaurant. During the ride over, as we’re moving through the storm, we discuss what lies ahead for Alex. He’s going to play a trio of shows with Weston later this year, the latest development in a reunion that’s come and gone a few times since 2006. Alex’s son was born several months ago and while he’s understandably shy to discuss his marriage and kid around a reporter, he does say that, even with a tour mapped out, he isn’t letting himself get too worried about being away from home. James Alex has grown up. He has found a real job. These are the things he does to find people who feel like him.